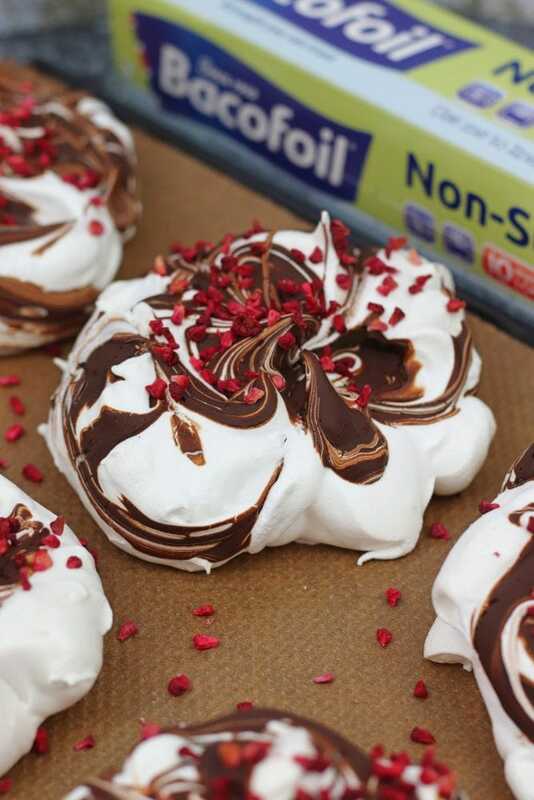 Individual Chocolate Swirl Meringues, perfect for an Easy Dessert! This post has been sponsored by Bacofoil® – all opinions and words are my own. So when I am thinking about making a dessert, I always want something chocolate themed. I won’t lie, I probably do eat too much Chocolate, but that’s me. Is it actually possible to eat too much chocolate?! Who knows… but I realise not everyone actually likes chocolate (my Dad). I know… the shock and the horror… but they don’t. Which is completely fair enough. However, when I am then trying to create a dessert to satisfy all cravings, it can get really very difficult! I love making a dessert for when my Fiancé (lol yes I’m now engaged WOOO) and myself go round my parents for dinner as my Mum usually makes a DELICIOUS Dinner, and making dessert is the least I can do. As my Dad, however, is the one to not be the biggest fan of chocolate, I do struggle. So, as I wanted to have something chocolate themed, but make sure my dad would accept it, I thought something with a hint of it would be best. How about one teaspoon of chocolate per dessert?! Yes, I think so. These beauties were born. 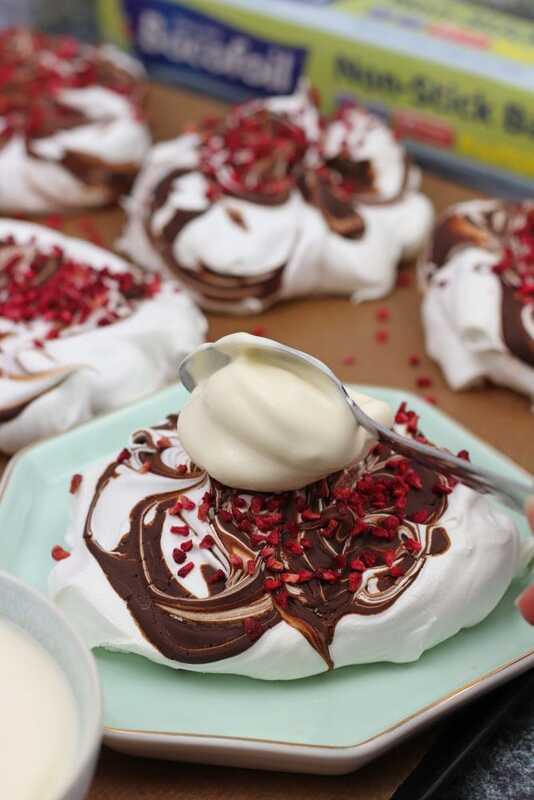 The BEST thing about making Meringue is it is such a crowd pleaser, and it’s easy to serve them up how you prefer. Add on some whipped cream, some fruit, some freeze dried fruits, etc etc. 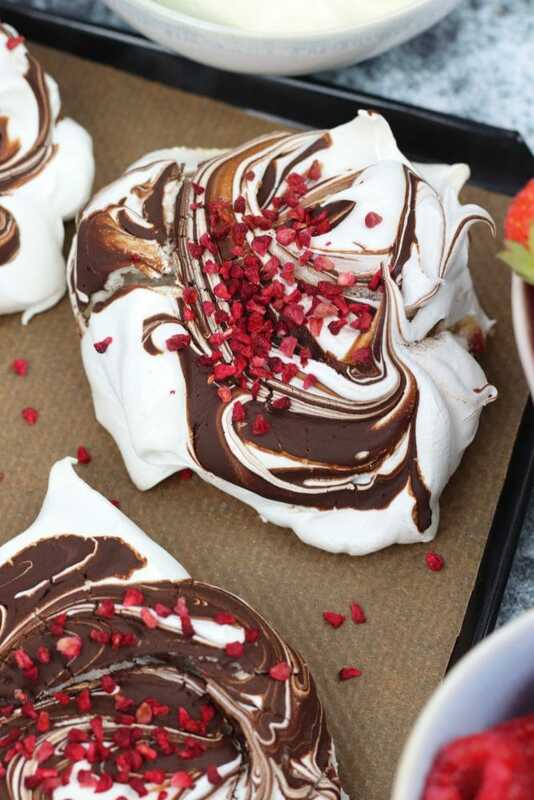 There are so many combinations of delicious toppings you can put onto a meringue its delightful. This idea partly came from going to a wedding fair recently at the venue my Fiancé and I have booked, where they had a ‘Create your own Pavlova’ station and I LOVED it. It was amazing. Some people are a little scared of making meringue, but it is honestly a lot easier if you have a super clean bowl, a clean whisk, and egg whites with absolutely no egg yolk in. This sounds a bit much already, but make sure you wipe your bowl clean (sometimes I rub a bit of lemon around to clean it, and then wipe down), make sure whatever whisk you use is super clean, and carefully separate your egg whites into a different bowl so that if you make a mistake, you can easily rectify the situation. Another thing that helps is if you have a good surface to bake the Meringues on to. There have been so many times when I have baked a perfect meringue, but it has stuck to the tray or baking paper. This is where the wonderful sponsorship of this post comes in – The Bacofoil® Non-Stick Baking Paper. 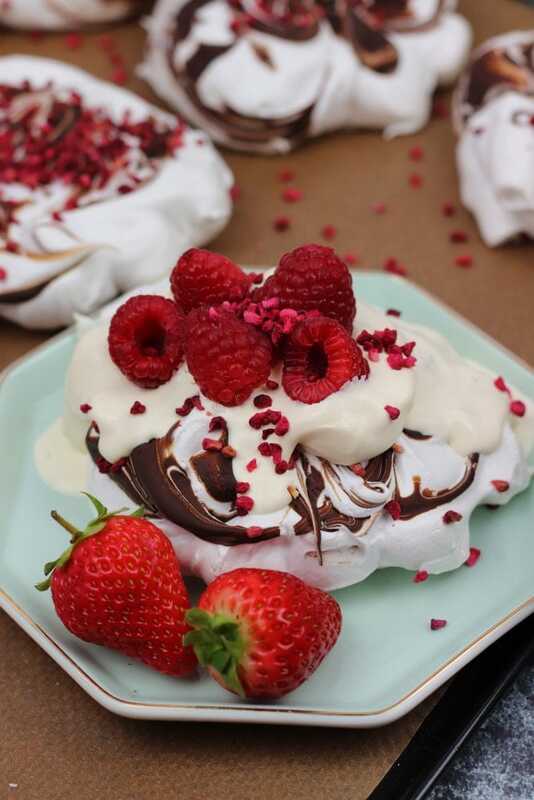 Quite often something like Meringue can get a little bit stuck after baking, but using this delightful Bacofoil® paper is insane, as it has a unique textured surface to purposely help prevent any sticking issues. The Bacofoil® Non-Stick Baking Paper has a dimpled surface, which looks like lots of little tiny bumps, and it makes it a lot easier to use compared to your standard non-stick baking parchment. You can see from the images the little dimples on the surface of the paper, and how easy it is to use. After a really easy bake and very little washing up, you can enjoy your dessert. The delightful thing about using this recipe is even though yes it does have chocolate in, you only use 1tsp per Chocolate Swirl Meringue, so it was enough to satisfy my cravings, but not enough for my Dad to be put off. 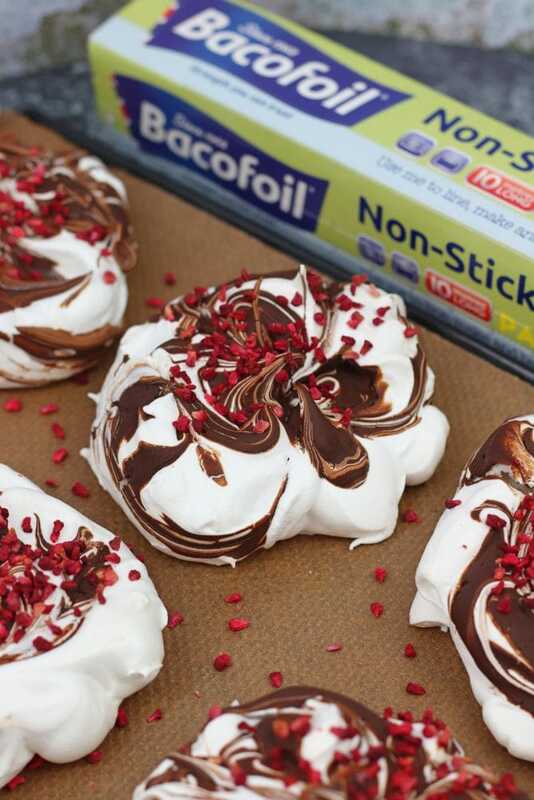 You can check out more information on the amazing Bacofoil® Non-Stick Baking Paper at www.bacofoil.co.uk! Preheat your oven to 120C/100C Fan, and line 2 Large Trays with your Bacofoil® Non-Stick Baking Paper and leave to the side. Make sure your bowl, and Whisk are nice and squeaky clean. I used my Stand Mixer with the Whisk Attachment. Add in your Egg Whites, making sure there is no egg yolk. Whip the Egg Whites up to stiff peaks, and start adding in the sugar 1tsp at a time. It may take a good few minutes to get all the sugar in, but its worth it. Don't pour it all in at once. Once all of the Sugar has been whisked in, add in the White Wine Vinegar and whisk again for about 2-3 more minutes. Whilst it's whisking for the 2-3 more minutes, melt your Dark Chocolate carefully till smooth. Dollop onto the Trays your Meringues. I used a heaped tablespoon each to make 10 Meringues, and then split any leftover between the 10. 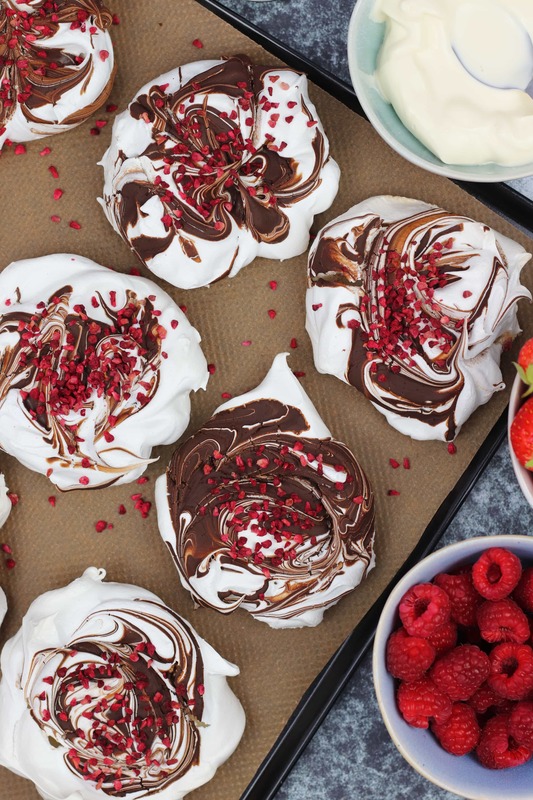 Add on 1 Teaspoon of melted chocolate per Meringue, and swirl it in slightly whilst shaping the Meringues into a good shape. 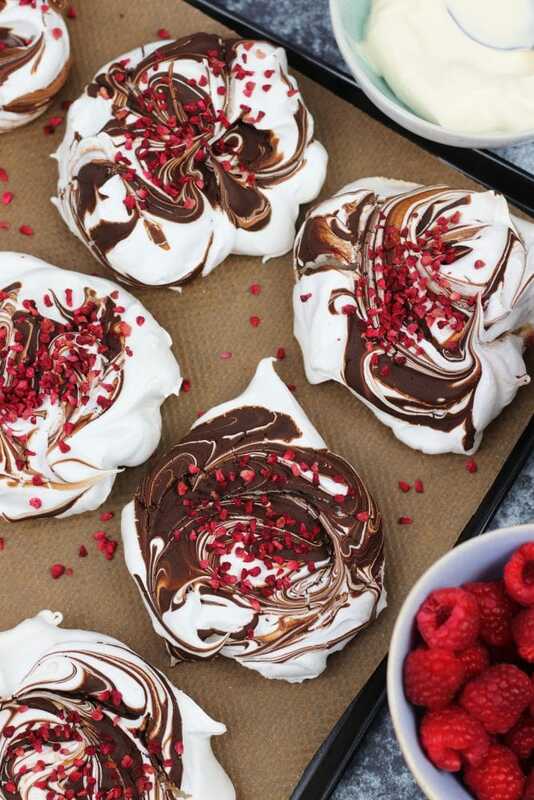 Once baked, leave the Meringues to cool in the oven with the door shut for 30 minutes, and then remove from the oven and leave to cool fully. 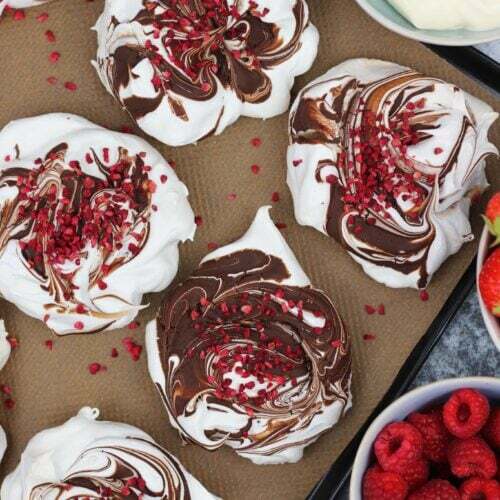 Serve your Meringues with whipped cream, fruit, or anything you wish! Enjoy! 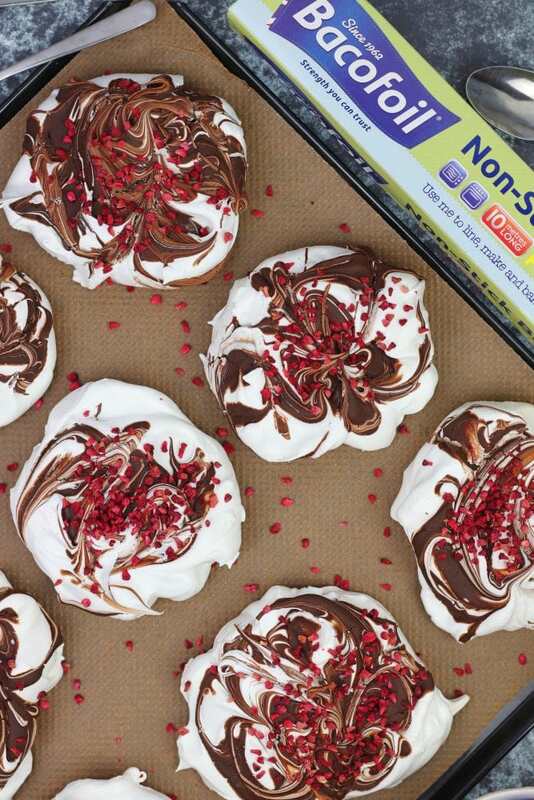 These Meringues will last in an airtight container for 1 month on their own at room temperature. I usually eat them within 2-3 days however. You can use Milk Chocolate if you prefer, but I love the Dark Chocolate. The Freeze Dried Raspberries are optional. This post was sponsored by Bacofoil® - all views and words are my own. Older Next post: Toffee Apple Cake! Newer Previous post: Halloween Cookie Bars!